Simple and chic, the Spinel sleeveless dress is as comfy as it is stylish. The bold tone of this wardrobe staple brightens up your look and can be styled effortlessly with flats or heels for your next holiday occasion. Elevate your holiday style with the Pyrope sleeveless maxi and achieve effortless quirky chicness with this number's extended silhouette. Never go wrong with a stylish long dress for an afternoon or evening affair. 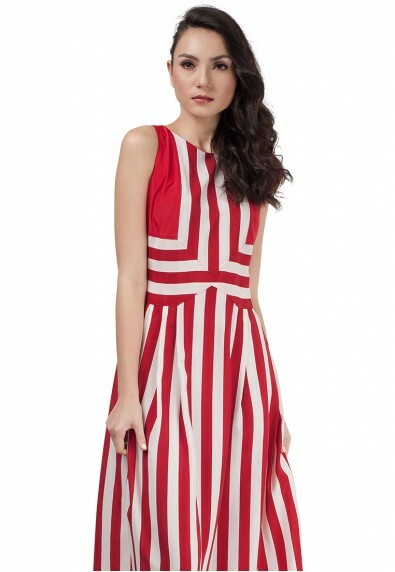 Go for a fiercely feminine look this season with the Carnelian sleeveless halter dress. This piece flatters the silhouette drawing the eye upward for a balancing effect. Wear this colorful number to an evening holiday soiree. Look as sweet as this candy cane inspired piece, featuring a two-toned oblique fabric for a charming effect. Take the Beryl sleeveless dress out on a perfect afternoon date matched with strappy heels or elegant doll shoes for an overall feminine vibe.